Organizations are increasingly turning to container environments to meet the demand for faster, more agile software development. 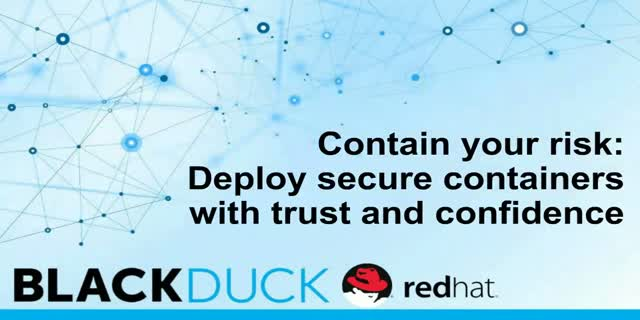 But a 2015 study conducted by Forrester Consulting on behalf of Red Hat revealed that 53% of IT operations and development decision makers at global enterprises reported container security concerns as a barrier to adoption. The challenges of managing security risk increase in scope and complexity when hundreds or even thousands of different open source software components and licenses are part of your application code base. Since 2014, more than 6,000 new open source security vulnerabilities have been reported, making it essential to have good visibility into and control over the open source in use in order to understand if any known vulnerabilities are present. • Why container environments present new application security challenges, including those posed by ever-increasing open source use. • How to scan applications running in containers to identify open source in use and map known open source security vulnerabilities. • Best practices and methodologies for deploying secure containers with trust and confidence.